December 28, 2017 at 10:06 pm. 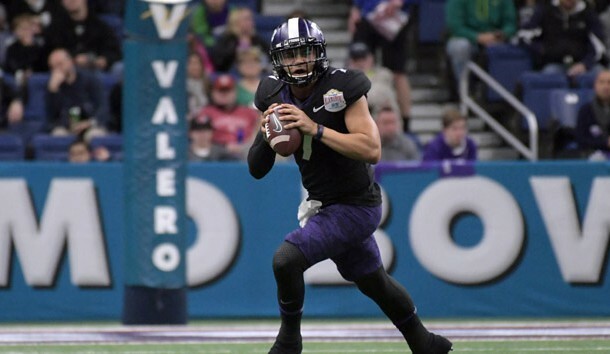 SAN ANTONIO — Big deficits do not bother TCU in the Valero Alamo Bowl. Two years after monumental comeback on the same stage, the No. 15 Horned Frogs rallied out of an 18-point hole behind Kenny Hill and a host of big plays to beat No. 13 Stanford 39-37 Thursday night. Cole Bunce drilled a 33-yard field goal with 3:07 left to put TCU over the top in the Alamodome. The Horned Frogs (11-3) were down 31-0 to Oregon in the Alamo Bowl on Jan. 2, 2016, before pulling off a stunning 47-41 win in triple overtime. While this comeback wasn’t as impressive, TCU appeared to be in serious trouble after falling behind 21-3 in the first half. Hill proved to be the catalyst, accounting for four touchdowns and 401 yards of offense. The senior quarterback completed 27 of 40 passes for 314 yards, two touchdowns and two interceptions. He also rushed for 60 yards and another score, and he caught a 27-yard touchdown pass. TCU’s rally was enough to overcome a valiant night from Stanford quarterback K.J. Costello and receiver JJ Arcega-Whiteside, who hooked up for three touchdowns, and Heisman Trophy runner-up Bryce Love, who rushed for 145 yards and two scores. Love did sustain a lacerated finger and was lost down the stretch. The teams, who played in and lost in their respective conference championship games, traded blows all night. The first Stanford touchdown followed an interception by Frank Buncom, who ended the night with two picks. Love finished off the quick 23-yard drive by powering it in from 15 yards out midway through the first quarter. The Cardinal went up 14-3 after Costello connected with Arcega-Whiteside on an 18-yard score late in the opening period. The duo then combined for a 14-yard touchdown pass in the second quarter. Hill scrambled for a 6-yard touchdown as TCU pulled within 21-10 before halftime. The Frogs carried that momentum into the third quarter, as Hill scored again, but this time on a 27-yard reception on a throwback from receiver Desmon White. TCU missed the extra point to trail 21-16. Love answered by exploding for a 69-yard touchdown through the heart of TCU’s defense, as the Cardinal went up 28-16. Hill once again used his feet to complete a 75-yard march by buying time to find White for an 11-yard scoring pass. The Cardinal added a field goal after a TCU fumble to take a 31-23 lead. The fourth quarter opened with Hill hitting Jalen Reagor perfectly in stride down the sideline for a 93-yard touchdown pass. The two-point conversion failed, leaving TCU down 31-29. A defensive stop by TCU turned into a 76-yard punt return from White, as the Horned Frogs took their first lead of the night at 36-31. That advantage didn’t last long. Costello and Arcega-Whiteside made it three TDs with a 4-yard connection on third down with about five minutes remaining. Bunce gave TCU the go-ahead lead, and Horned Frogs safety Innis Gaines intercepted a Costello pass to seal the win. NOTES: TCU is 16-16-1 all time in bowls. … Stanford played in a bowl for a school-record ninth consecutive year and is 14-14-1 in postseason games. … TCU coach Gary Patterson is 10-6 in bowls and 3-0 against Stanford. … Cardinal coach David Shaw has the most bowl appearances (seven) and wins (four) in school history.